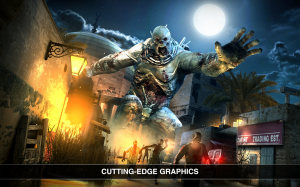 Dead Trigger arrives to the Play Store for free. The popular apocalyptic Madfinger Games is available for users of Android 4.0 and up. The sequel to the hugely downloaded first person zombie shooter has come back with an impressive update. Dead Trigger 2 brings the zombie-killing action with a new storyline, now playing in “real-time”. The game supports on-screen touch controls as well as gamepad. This sequel includes several improvements. The first obvious thing we can see is that graphics are immensely better than the original, including real time water reflections, dynamic vegetation and enhanced ragdolls. The number of sceneries has also been increase, and now you can kill zombies from the eerie alleyways to the African desert. Many other changes of this update are referred to gameplay balancing and bug fixing. In the gameplay balancing, the main problem was the difficulty of the special zombies, so several changes have been made to allow the player to kill them easily, without requiring so many expensive consumables. Among these changes, zombies’ difficulty and several missions were rebalanced, and some damaging effects have also been adjusted. Regarding the bug fixing, crashes with Samsung S III and IV have been fixed as well as broken fonts, Pain-killer is working fine and some problems of visibility in the menus have also been repaired.